Need a change of scenery and fancy seeing something exciting? 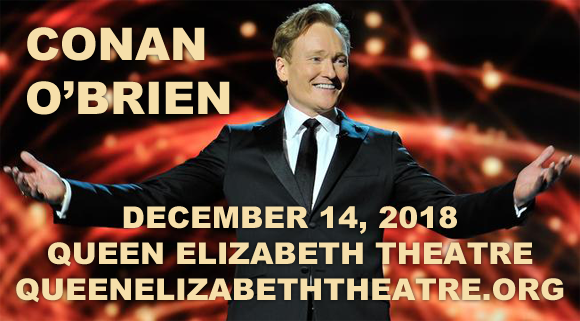 Why not come to Queen Elizabeth Theatre on Friday 14th December 2018 to see the incredible Conan O'Brien! A truly unforgettable evening, Conan O'Brien has a huge fan base for a reason and will leave you wanting more… But I'm sure we don't have to tell you that! Tickets are out and available now – what are you waiting for?! For theatre fans, the Queen Elizabeth Theatre is without a doubt the premier venue for the cream of the crop when it comes to all things in performance art, dance, cabaret, musical theatre, concerts and more. It’s for this reason that the Queen Elizabeth Theatre is widely regarded as one of the best entertainment venues in Canada! Thousands flock to Vancouver just to witness the phenomenal musical and acting talents that grace the Queen Elizabeth Theatre stage every year – will you be one of them? This Friday 14th December 2018, get your tickets ready and prepare for the unforgettable experience that is Conan O'Brien at the Queen Elizabeth Theatre!